Help Me Save My Tomato Plant!!! About two weeks ago we were given this tomato plant. It was about 2 feet tall and spindly. I've been doing everything that I can to keep it alive, but now the plant is 3 feet tall and even spindlier. 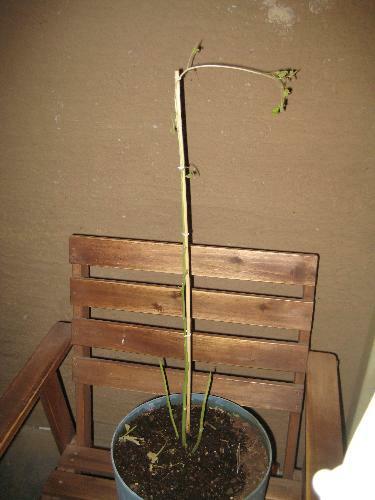 To top it all off, the plant had most of the leaves wilt and die. I cut the dead leaves off so that the plant would not try to draw all the water to the dead leaves. Please see the pictures below and give me any feedback you can. The plant was given to us in a pot and was grown indoors at the old location. I had it indoors at my house as well until I moved it outside yesterday in hopes to save it. the miricle grow is good stuff...but first you need to pinch out the top few growing leaves/shoots...and then your plant will send out shoots from the sides and then your tomatoes should start coming...good luck ! !